Fall has arrived my friends! I am so elated! By far my favorite season. And not just because I was born during it. I have to like it if that is the case right? I don't know about where you are but the first day of Fall in Knoxville was perfect. The sun came out, the air was crisp and clear...I even got a chill while walking the neighborhood Sunday night. Perfect. Have I turned the heat on in my car already? Maybe. If my dumb seat warmers worked would those be turned on too? Of course. Don't judge. On this fine Fall Tuesday I wanted to share one of my favorite most recent finds: Real Simple's Baked Barley Risotto with Butternut Squash. I mean...I bet we made it at least three times last year. And this recipe makes A TON of "stoup" (as Rachel Ray might call it). This is what I call comfort in a bowl. 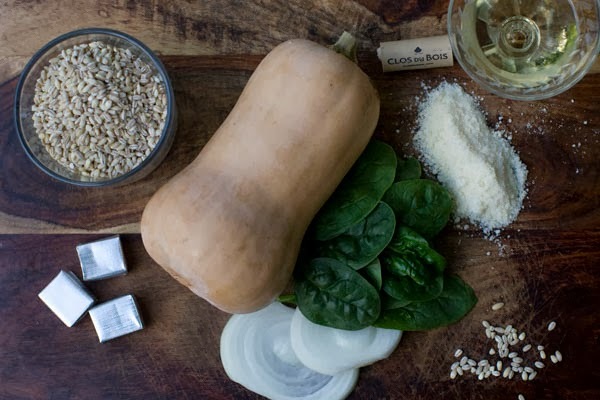 The nuttiness of the barley and Parmesan cheese is so yummy with the sweet squash. Personally, I prefer this "stoup" over the purred sweeter versions you might typically find for butternut squash. And unlike the sweet version, you need no side or bread to help fill you up. This is a hearty "stoup" that can stand alone. If you are like my husband who thinks you need additional carbs with any soup served--grab a baguette and slice a few pieces, drizzle with olive oil, sprinkle with some of your extra Parmesan, and toss in the toaster oven for a little crisp. Enjoy this recipe! Many thanks to Real Simple for never letting me down!